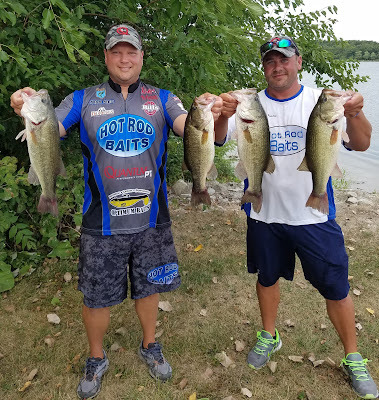 This past Saturday was the third and final stop of the Hot Rod Baits Bass Series at 12-Mile Lake near Creston, Iowa. 12-Mile lake is a 635-acre lake that was created by flooding a valley around Afton, Iowa. It is a typical Central Iowa man-made lake, a lot of standing trees, rock piles, roadbeds, brushpiles and plenty of deeper water, the maximum at this lake being just over 40 feet. The water quality is always pretty good at this lake, which has allowed the bass population to flourish. The lake did not disappoint, and my partner Brian Bowles and myself had a great time figuring out these bass. Friday was a long day on the water, covering as much water as possible. Shallow, deep, weeds, wood we gave it all a good look with a variety of baits. We ended the day with about a dozen Quantum Rods/Reels on the deck of the boat, we threw everything at them! We decided to bet our tournament finish on two areas that we found during the Friday practice day. We felt pretty confident we could get a limit of 6 bass, but really didn't know if they would weigh 12 pounds or 15 pounds at the end of the day. The day was a great one to fish, light winds, temps ranging from 55-80, a great day on the lake for August. We were able to capitalize on the two main areas quickly that morning, and were culling fish within the first two hours of the tournament. We continued to work the areas over and expanded our casts in those areas. We were feeling pretty good and there were only 4 rods/reels on the deck at this time. We were going to finish the day throwing and dragging craw baits. Color didn't seem to matter on this day, as we caught fish on every color we tried. The highlight of the tournament was when Brian went back to back with 3.50 pounders. He set the hook on the second fish before I had the first fish tagged and in the livewell, it was awesome and we had things going our way. We continued to work over our areas, our baits were working and we were going to really focus in on the technique. On the way back to the weigh-in we always seem to talk about what we did and how we think we might end up, a top 5 was our goal coming into this event, and we figured that we did enough to achieve that. It was time to get the weigh-in started and see just how much our best 6 keepers weighed. We ended up with 16.68# and ended up in 4th place. We were pleased with our efforts and our finish. The prize money was a nice bonus to a great weekend of fishing. Thanks to all my supporters and their great products, please click their link on the right side of the website to see their various products and services! I have been fishing for over 25 years, and many of those being a student of the game. I have read countless articles in various magazines, watched A LOT of fishing shows, and fished with dozens and dozens of anglers from around the state. Each and every time I fish, my goal is to learn something about this great sport. Whether it be about tackle, fish locations or even a helpful tip. I recently was published in the August edition of The Iowa Sportsman Magazine with an article that highlights "Hacks Every Angler Should Know". Here are three tips from that article, to read about all 15 of them, get your hands on the latest edition of The Iowa Sportsman Magazine. You can subscribe for 3 years for under $30 (36 issues), a fantastic value. #1- No matter what kind of reel you have, it was designed to have a certain amount of line on it. The spool should be full at all times. An easy way to save time and money is to line your spool with cheap 15# line until it it is half full. Then take a marker and color 3 feet of that line. From here tie on your choice of line and fill ‘er up! When you start to see your marker color, it’s time to get some more line on your reel. 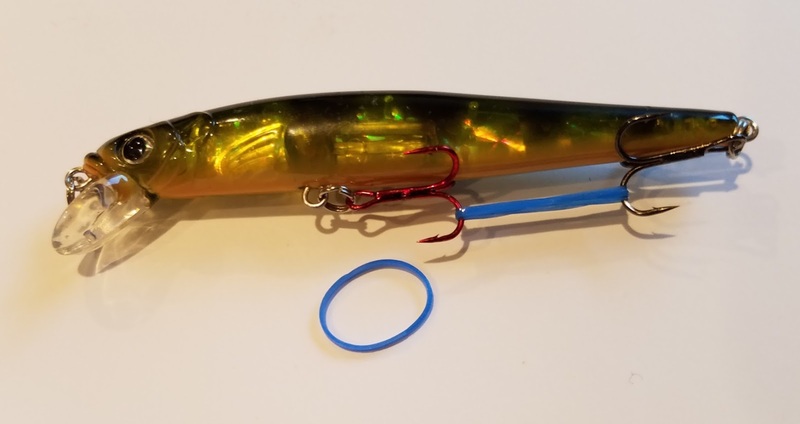 #2- Crankbaits are awesome baits, however they are a nightmare to keep in a tackle box. To help with this common problem, get the disposable hair bands that girls use to tie up their hair. Wrap these small bands around the treble hooks a few times, it will keep them together and keep your baits more organized. also find that you can fit more baits into your tackle boxes. #3- Rusty hooks are useless, and won’t catch as many fish. Grab a bunch of toothpicks and break them in small pieces to place in your tackle box along with your hooks. The wood will help absorb the moisture and keep your hooks fresh. Just a few little tricks I have picked up over the years, hope they help you be more successful, and save some money too!